100% original manufacturer compatible, Guaranteed to meet or exceed original specifications. Maintenance Kits contain refurbished fuser assemblies that have been thoroughly cleaned and tested. 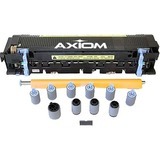 Axiom replaces all replaceable parts of the fuser and we use genuine OEM fixing film sleeves to rebuild our fusers.